The white-tailed eagle family at NWMCWC’s West Ardhu site is ticking along at a steady pace. The chick, now nine weeks old, is both well grown and well fed. He only has one more week of growing to get through before attention turns to his first flight. For the last ten days “Star” has maintained a stoic presence by his nest. “Hope” is often away, and when she returns, she is mostly empty-handed (so to speak). Though we cannot see what the eagles have in their larder from the hide, I get the impression that the hunting is good and the living is easy. When watching the adult eagles, it strikes me that they have very different “personalities”. Further, unless they are united by a common cause – such as the need to protect their nest, they seem to work to a rather individual schedule. 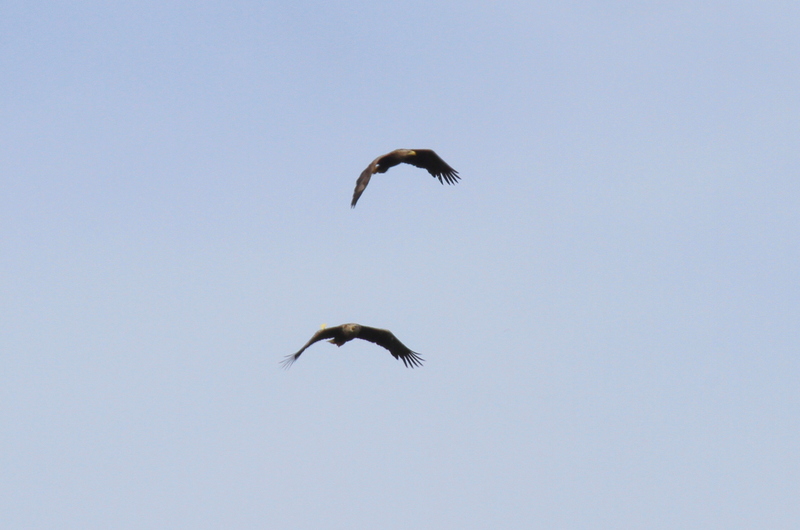 White-tailed eagles pair for life. At up to 30-years in the wild, this can represent a very long and productive relationship indeed. However, unlike many of the other socially monogamous birds that I have observed, I have never seen them preen one another [allopreening] or demonstrate anything that could be interpreted through human eyes as affection, now that the main pairing period is over. They sometimes perch close – but I have not yet seen them side by side. They occasionally vocalise together or engage in a brief bout of mutual soaring, but that’s about as saucy as it gets at this time of year. If I’m honest, they treat each other with what appears to be a mixture of tolerance and indifference. I don’t see the continuous pair-bond reinforcing behaviour that is so obvious in parrots or cranes for example. I suppose the eagles are just a bit more subtle about it, and don’t engage in Public Displays of Affection?! Hope seems to have a more confident and curious attitude than her partner. This week, for the first time, we were able to enjoy prolonged views of her on the ground in front of the hide. The huge talons of a white-tailed eagle give it a somewhat “considered” gait when it wanders through the brash. Watching the majestic Hope tootle about like an extra-large chicken certainly raised a smile or two from the group. I’m not sure what she was up to – looking for small mammals, possibly. She had that fluffy, mischievous look about her that birds sometimes get when they’re really interested in something. Star, meanwhile, has been busy causing traffic pile-ups on the Dervaig hairpin bends. Tom (my work experience student) and I were driving back from a Ranger Service drop-in at the Torr hide. As we hit the highest part of the road, I almost had to swerve to avoid Star – who looked like he was on course to fly through my side window! There were quite a few cars and campers about, so the scramble was on for everyone to get off the road safely and get their optics out. I often wonder if the eagles are able to recognise my van, crawling like a wee green snail up to the hide every day. It was an incredible encounter. Star stayed with us all for quite some time before floating back to his family at West Ardhu. Here are Star [top] and Hope [bottom] engaging in a spot of mutual soaring!